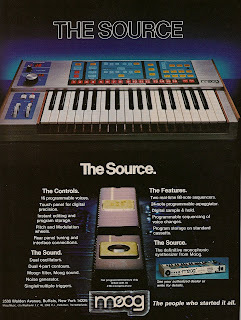 Moog Source advertisement from page 71 in Contemporary Keyboard Magazine July 1981. I finished off Part 1 of this blog post writing about how much I loved all the futuristic aspects of the Moog Source. 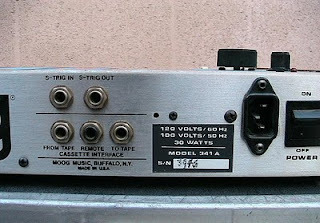 But, all that futuristic stuff aside, to me the most interesting thing about the Source was Moog's decision to add major competitor Roland's DIN sync technology to the machine. I did some quick Google searches to see what kind of information I could find out about this addition, and two great online discussions bubbled to the surface. The first discussion was from June 2005 and can be found on the Moog Music Forum. In the topic entitled "Differences in Moog Source", the question of differences in the back panel layout came up. 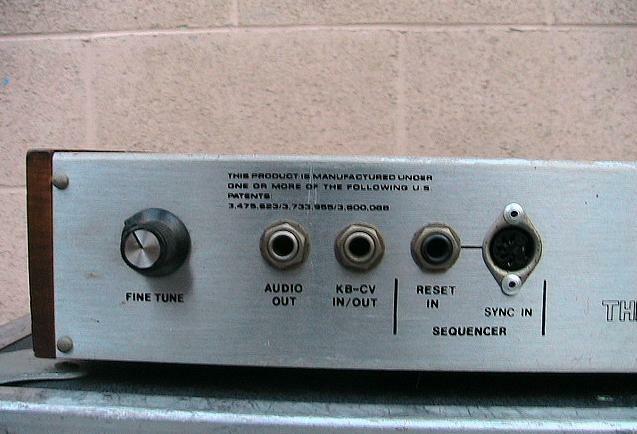 According to forum participant "mc", the DIN sync interface was added in mid-1983 (a year and a half into the Moog Source's manufacturing run), and could apparently control the arppeggiator and sequencer. "Every Source has CV/Trigger jacks. 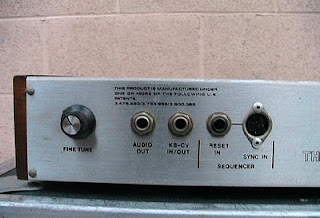 Newer Sources added a Roland DIN sync drum interface. This addition was implemented May 1983 after serial 3180 on 120VAC versions and 3285 on export 220VAC versions. There was a kit to upgrade older Sources, mine has the upgrade." 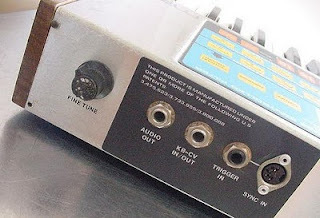 "The Sync input was standard on all later Sources (it's mentioned in my manual as an addendum from February 9, 1983). There was a period were the cassette input was re-assigned to sync in via factory retrofit, and a sticker applied to the rear of the case. It's a rather bizarre semi-solution. The arpeggiator needs a clock signal in order to run, but the actual notes are triggered by pulses to the "reset" in." Based on this info, I decided to look at images on the Web to see how the DIN sync was implemented. Sure enough, I found examples of all three versions. You can view a photo of a pre-DIN sync Source below, taken from this December 2009 MATRIXSYNTH auction post. You can clearly see the Audio Out, CV, S-trig, and Cassette Interface connections. This is exactly what the back of the Source in this 1981 advertisement looks like. A May 2007 MATRIXSYNTH auction post links to Flickr images of what I believe is the retrofit/sticker version of the Source. 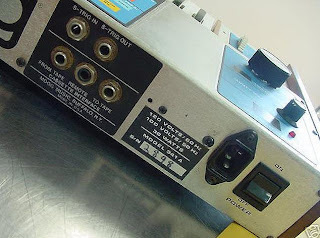 I've included both the left side and the right side of the back of the Source below, where it appears that the cassette interface connections and S-trig connections were expanded and moved to the right side of the instrument. As mentioned by Analogika in that 2009 comment, you can see where the cassette interface was re-assigned to sync. A December 2007 MATRIXSYNTH auction post links to images of what looks to be the final version of the Source with the silk screened labeling. Again, I've included both the left side and the right side images below. More interesting than answering the questions of "when, where and how", is the "why". Why would Moog install a competing company's technology in their synthesizer? "On another note, doesn't it seem odd that Moog Music would curry favour with a Japanese competitor by implamenting the DCB buss?" No one really answered this question, but assuming that "ebg31" actually meant the DIN-sync addition, and not DCB buss, then yes, it was odd that Moog would include it, but maybe not for reason "ebg31" suggests (curry favour with a Japanese competitor). You have to remember that the DIN-sync feature looks like it was added to the Source around early 1983. Synth companies from around the world, including Moog, had for some time already been slowly coming together on the development of the MIDI specification. So, companies were already willing to work together in some form. But what I find odd is that Moog decided to implement DIN sync when MIDI was about to be launched, or had already launched. So, would Moog ever implement MIDI on the Source? You can find Moog's official answer in the "Questions" section of the November 1983 issue of Keyboard, where Keyboard reader Richard De Laura asked, "Are any manufacturers planning to retrofit their older synthesizers and programmable effects with MIDI interfaces?" As part of the answer, Bob Doerschuk wrote that, "A Moog representative stated that the Source and Memorymoog are the only two digital microprocessor keyboards produced by Moog, and that while the Memorymoog has a MIDI interface, no plans are being made to retrofit the Source." So, although there was a good reason why the Moog Rogue never got a MIDI due to the fact that it didn't have a microprocessor, the Moog Source definitely would have qualified! Hi, I have the Source with the DIN sync input, and my contribution to your blog is that I can only got it work with the sequencer the arpeggiator doesn't work with the sync. I used an Arturia Beatstep Pro to trigger the Source. Well, actually the arpeggiator does work! !